96, of Columbus, passed away Tuesday, April 9, 2019, at the Village of East Harbor, Chesterfield Township. She was born in Tokyo, Japan, May 19, 1922, the daughter of missionaries George and Marie (Geissinger) Noss. Her marriage to Wallace Gibson was October 28, 1943, in Greenup, Kentucky. Wallace passed away November 25, 2011. Margaret received her bachelors of science degree in Home Economics from Berea College, and a Master of Library Science from the University of Michigan. She taught in Richmond and L’anse Creuse Public Schools and retired as a media specialist in 1986. 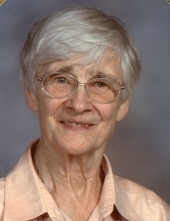 She was a longtime member of the United Methodist Church in Richmond. She enjoyed reading, stamp collecting, handwork, gardening, traveling and spending time with the family. Surviving are six children and their spouses, Norman and Dianne of Richmond, Lawrence and Shirley of Ringgold, Georgia, Daniel and Karen of Hillman, Mark and Ann Marie of Bloomfield Hills, Charles and Cathy of Casco, and Lynn and Chris Weber of Rockford; 16 grandchildren, 33 great-grandchildren; brother and sister-in-law Charles and Ann Noss of Stanton, Kentucky, sister and brother-in-law Martha and Peter Whitis of Eau Claire, Wisconsin, as well as several nieces and nephews. She was preceded in death by her sister Dorothea Wiley, brother-in-law Vincent Wiley, and sister-in-law Toni Noss. The family honors the memory of Margaret and invite you to visit and share memories Thursday 3:00 to 8:00 p.m. at Kaatz Funeral Directors, Richmond. Funeral services will be 10:00 a.m. Friday with 9:00 a.m. visiting. Rev. Sandra Paran, Heart to Heart Hospice chaplain, will officiate. Burial will be in Kittridge Cemetery, Columbus Township. Memorials are suggested to “Wishes of the Family”. To send flowers or a remembrance gift to the family of Margaret Gibson, please visit our Tribute Store. "Email Address" would like to share the life celebration of Margaret Gibson. Click on the "link" to go to share a favorite memory or leave a condolence message for the family.